Launched in the UK in January 2009, Cristal is a double cross-linked, monophasic hyaluronic acid based dermal filler from Germany. Cristal has been designed from biofermentation hyaluronic acid, a substance naturally present in our body; which the makers claim makes it safe and completely biocompatible, as well as wholly biodegradable. The manufacturers state that they use an advanced manufacturing process and Non Granular Consistency Technology (NGCT) which produces a smooth solution of gel that flows into the skin more easily. They make the point that most other hyaluronic acid based dermal fillers are granular consistency gels. Cristal is also said to have the highest purity of any hyaluronic acid based filler on the market, which is virtually free on endotoxins (less than 0.01 Eu/mg) and has no detectable proteins, making it less likely to cause adverse effects. 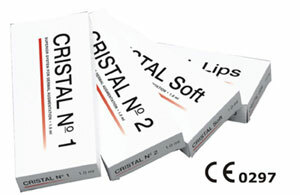 Cristal has four different formulations within it`s range: No.1 , No.2 , Soft and Lips. No. 1 (20mg/ml of double cross-linked NaHA) is an ideal product for superficial wrinkles and can be used for perioral wrinkles ("smoker lines"), lip commissures, crow`s feet, and forehead wrinkles. It is injected into the superficial to mid dermis with a 30G needle. No. 2 (24mg/ml of double cross-linked NaHA) is an ideal product for medium to deep wrinkles, such as nasolabial folds, frown lines and skin depressions. It is injected into the mid to deep dermis with a 30G needle. Soft (14mg/ml of non-cross-linked NaHA) is an ideal product for skin rehydration or mesotherapy. It is injected into the superficial dermis with a 30G needle. Lips (14mg/ml of double cross-linked NaHA) is an ideal product for injection into the lips for augmentation with a 30G needle. The manufacturers claim that Cristal is effective from 6 to 12 months. The manufacturers recommend that Cristal must not be mixed with other injectable implants. Avoid using aspirin, non-steroidal anti-inflammatory medications, St. John`s Wort, or high doses of Vitamin E supplements prior to treatment, as these may cause bruising and bleeding in the treated area. The treated area should not be exposed to excessive heat (e.g. sun or UV tanning, laser, IPL) or extreme cold until any initial swelling or redness has resolved. Transient erythema (redness), swelling, pain, itching, discoloration or tenderness at the implant site is to be expected with injections of this type. Typically resolution is spontaneous, within one or two days after injection into the skin, and within a week after injection into the lips. The manufacturers claim that treatment related adverse effects, such as swelling and pain occur less frequently with Cristal than with other hyaluronic acid based fillers because of the high purity of the hyaluronic acid used in Cristal and a manufacturing process which ensures that the product is virtually free of endotoxins and proteins. This depends on the area treated and how much is required, and the practitioner doing the treatment, but price ranges are in the region of £200 - £300 per treatment. Click for ALL Cristal clinics in the UK & Ireland registered and verified by Consulting Room.